Homeslice is a relative newcomer to the pizza scene in London, but has been getting rave reviews from locals. I walked into the Covent Garden place to find a cute and bustling restaurant. The tables were full and the line was long, but despite all of that, they hadn’t skimped on ensuring the kitchen had enough room. Always a good sign. The good (and bad to some people) thing about Homeslice is that there’s only one size – 20″ pizzas. My mind was boggled at how a place can claim to be inspired by Neapolitan pizza but then only offer a 20″ pizza. Surely, they were going to go with a more Brooklyn style. But no, they are actually pulling this off. I was in a little bit of a rush, so I opted to get a pizza to go instead of waiting for a table. And given the variety of options, I was pleased that they could do a half and half for me. 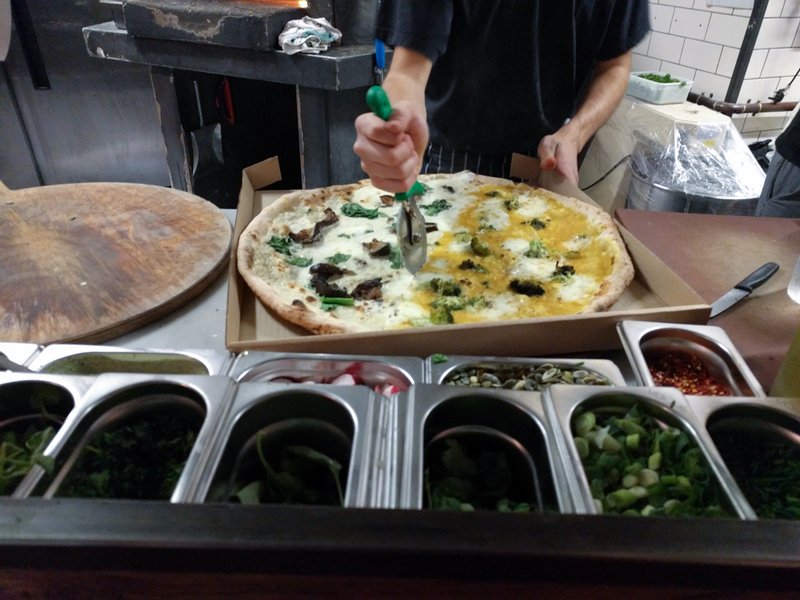 I ended up choosing half with aubergine, cauliflower, spinach, and harrisa and the other half was butternut pumpkin, broccoli, pecorino, and crispy onions. Let’s just be clear – the aubergine won hands down and all the credit goes to the harissa sauce. A Tunisian chili pepper paste, it provides a kick to a whole new level. While La Vic’s orange sauce is still the reigning champion, I now have a fall back when I run out of orange sauce. Despite the size of the pizza, there was decent leoparding around the crust, the bottom had just the right charring, and the crust was paper thin. The only downside to this fantastic creation was that the size did make a pizza that would already be floppy even more floppy. I found myself having a little bitt of trouble eating a slice, but I figured if I were in the restaurant a fork and knife would have been handy. But wait. How the hell do I eat a 20″ pizza by myself? No matter how hard my training was that day, I couldn’t handle a 20″ pizza myself. That’s the great thing about pizza – no one says to great pizza. As I walked back into the hotel, I made friends with the bartender and concierge and we partook in a beautiful lunch provided by Homeslice.